Where did the buttons come from? I want to ask if anyone remembers a large field, down a lane off of the London Road at Tarpots which was known locally as ‘Forty Acres’. I played there as a child in the early to mid 1950s and remember finding large numbers of buttons there, not just a few but hundreds. As a child I didn’t give it much thought but I would really like to know how they got there. I was born in Benfleet in 1942 and lived in Clarence Road. My first school was Benfleet Primary and then I went on to King John School. 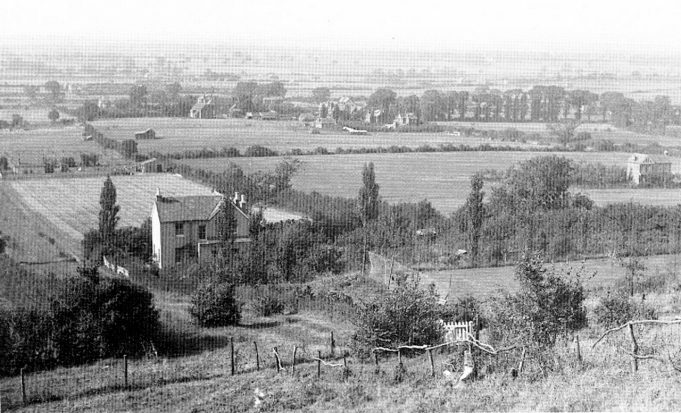 When I was around 11 years old my family moved to a house in the London Road, near Tarpots, called ‘Baradine’, which is no longer there now, having been demolished to make way for a large estate. I left Essex for Kent at the age of 15 in 1957 when my family moved. I do have so many happy memories of my childhood in Benfleet, where my father was a builder, F.B. Stevenson, and I still think of myself as an ‘Essex girl’. I love your web site and call it my magazine as it is just like being back home when I read all the news. If anyone can shed any light on where the buttons came from, I would be so grateful. The old photo, below, was most certainly taken a lot earlier than the 1950s. However, it does show the vast expanse of open land where it is believed ‘Forty Acres’ was. From the map it can be seen that this area corresponds now to the land situated behind Robert Drake School. View from St Peter's Churchyard looking down across 'Forty Acres'. The house that is visible stands at the top of Chesterfield Avenue. Well I’m so pleased that other people can remember the buttons!! I was beginning to think my mind was playing tricks . I would welcome any contact with anyone who may remember me, as I now live in Kent and have done since 1956/7 I still think of Essex as my home. I remember 40 Acres so well, plus some of the names who also played etc over there ! The picture/photo taken at the top of Church Hill you can just about see the old bungalow (built in the 30’s) that I moved into in 1969 in Spencer Road and lived there for 35 years over which my husband being a builder changed our home into a 4 bedroomed house. I was also a Lollipop Lady for 10 years outside Robert Drake School when my three kids were there and when they left….. Sorry, tried to post a photo but it’s all too hard today. I’ll try again when my mind is more active. Hate this getting old business. Doug’s photos can be viewed by clicking on this link. I can confirm that the button factory was on Manor Estate in 1954 at the bottom of Armstrong Road. Mostly lady workers there at that time. The buttons most likely would have come from the old button factory on the Manor trading estate by forty acres. PS Janet, Your name sounds familiar to me, I was born in 43 and played in Forty acres, lived on the hill next to St Peter church near where that photo was taken from, also went to King John school.